Anchorage, Alaska – Most drivers avoid icy roads. 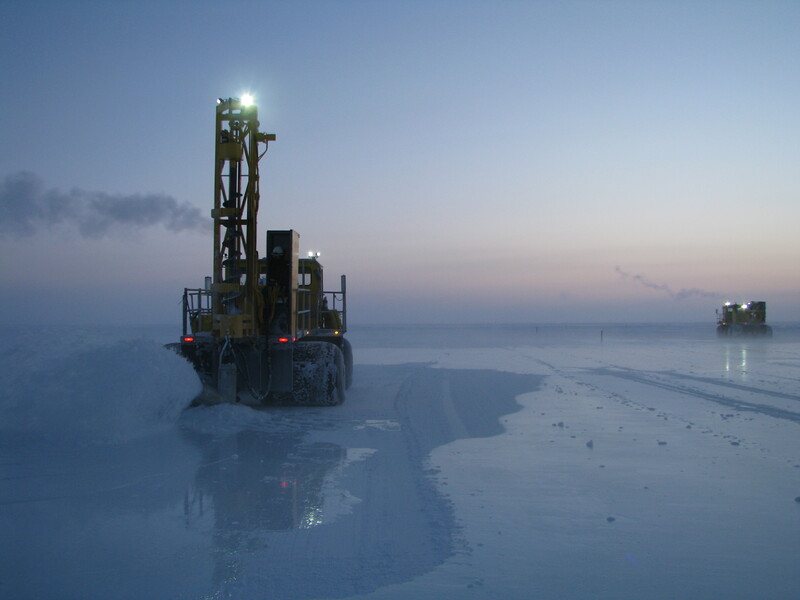 But on the North Slope, ice roads offer the best, most cost-effective means of moving heavy equipment, materials, and personnel through road-less areas, particularly when those areas are located offshore. One North Slope operator relies on Peak Oilfield Service Company’s expertise to build these frozen works of critical infrastructure as a way to access the Spy Island Drill Site, a man-made gravel island located four miles off of Alaska’s northernmost coast. Beginning in early to mid-December, Peak’s ice road crew expertly crafts the road using sea water from the Beaufort Sea. Starting at Oliktok Point, the crew uses augers mounted on LATV pumper units to drill through the ice pack and to flood the area with a slushy mix of snow and water, building up the surveyed route. Guiding equipment over the ice pack, the crew layers, smooths, and shapes the road with LATV Pump Units and Tuckers as they go – layer by layer, mile by mile – until the ice road reaches its final island destination. Construction is complete when the ice thickness reaches an even 72 inches, and ramps and storm surge berms are in place. Subcontractor Lounsbury and Associates provides survey support and Ausenco Engineering provides technical guidance to the ice road crew. Currently, Peak is halfway through its second season of building and maintaining ice roads for the Italian operator. The post Peak’s ice roads critical to Arctic operations appeared first on Bristol Bay Industrial.